“Based on the potion classes of a well-known school of Witchcraft and Wizardry.” That’s what the back of the box reads, anyway. 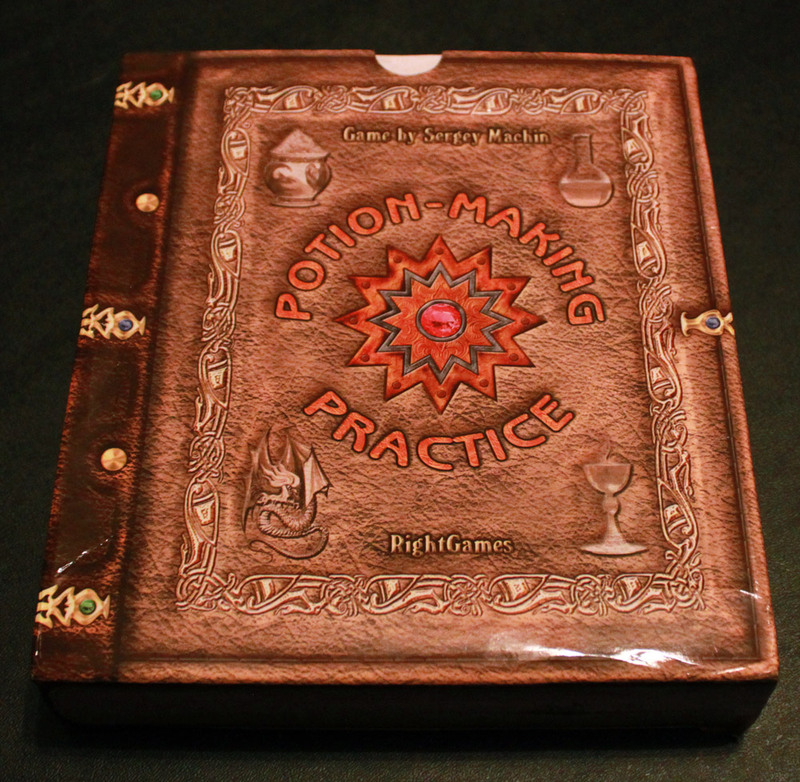 Well, lack of Harry Potter tie-ins aside, the next game from Right Games is “Potion Making Practice.” Are your alchemical talents up to the task? Will you wow the rest of the class with your expertly mixed formulas, or will you watch in jealously as the other students produce useful potions, powerful talismans, and beautiful magical creatures? There’s only one way to find out. Potion-Making Practice follows the pattern of the other Russian games in that the rules are pretty simple and straightforward. Once again, your turn consists of drawing a card and playing a card. However, PMP steps up the complexity in what actually happens when you play cards. Each card is divided into two sections—elements and formulas. Elements represent basic ingredients—the building blocks of your first potions. Formulas represent the actual potions, elixirs, powders, talismans, and creatures that you are creating, with the ingredients required listed on the side. When you start, most players will play their cards to the central “Desk of Elements.” Cards there may only be used for the Element on the card. You get a point if the element you just played is not already represented on the desk. 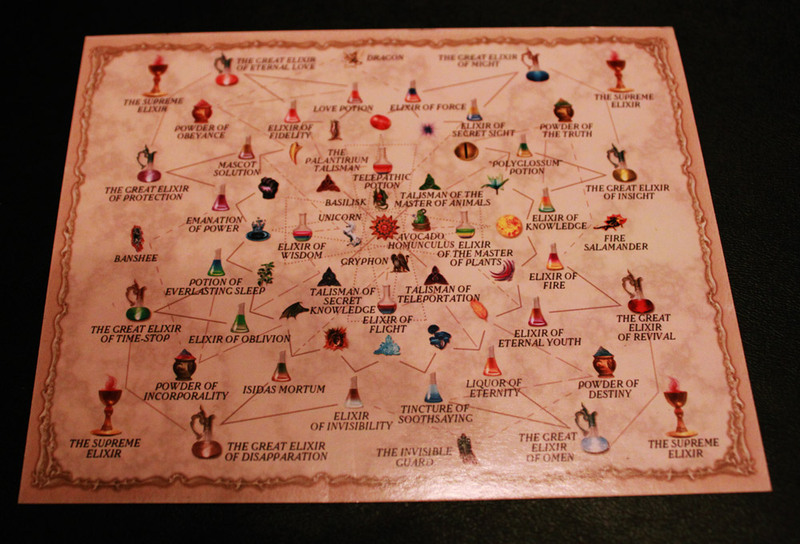 You can also play your card as the formula, but to do so, you need to be able to draw all the ingredients from the table—either elements from the Desk of Elements or potions/elixirs/powders from a player’s area. You can’t play cards from your hand directly as ingredients. You can take potions or powders that other players have played, but if you do so, they get some points too. The more powerful the potion, the more points it’s worth, ranging from two points for basic potions all the way up to ten points for the Supreme Elixir or Talisman of the Master. In addition, any time a formula is used as an ingredient, all of its ingredients are returned to the Desk of Elements to function once again as Elements. Finally, there are about six “spell” cards. These cards have special actions instead of formulas. 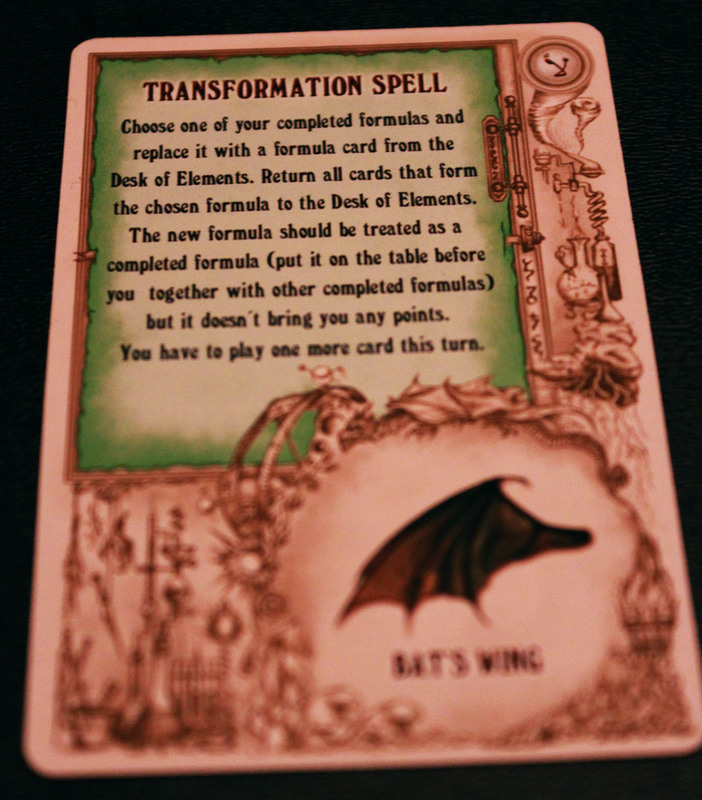 While they still have elements, they give you the ability to take a card from the Desk back into your hand or shift around your formulas in some way to help you get the item you need for your next potion. The winner is the player with the most points once all the cards have been played. It’s no secret that I like my games to come with a thematic flavor, and perhaps for this reason Potion Making Practice was my personal favorite of the Russian games. It might not be as tight as The Kingdoms of Crusaders, but you do feel like you’re mixing up mystical elixirs, and many of the potions or, uh… things… you can create (Avocado Humunculus, anyone?) are humorous. It also supports up to six players with one box, so you’re not limited to one-on-one play. Not joking about the avocado thing. In general, PMP stays pretty balanced. In several games one person pulled ahead early, but the others caught up by the end. The shared element desk and the ability to use potions from anyone helps keep you in the game. You may not have the right cards to play with the current elements available, but when someone plays a potion, you might be able to use it to make something even more powerful. In addition, the highest-scoring formulas are not ingredients for any other formula, meaning no one will use them and thus you won’t get any points for sharing. The inclusion of spell cards adds a little extra strategy. Instead of always being stuck with what you’ve drawn, you can manipulate the resources available to craft a high-powered potion. In addition, spell cards let you play another card immediately afterward, preventing any other players from stealing the potion you just set yourself up for. The game isn’t perfect, though, and with more players, it tends to break down the most. While the public Desk of Elements prevents anyone from getting screwed by the randomness of their own hand, it is possible to get frustrated when the player before you consistently takes the last element you need or a potion you’ve been waiting for just before you get your chance. While you can usually pull back up by using their potions to create better ones, sometimes the cards you draw go against you and you sit tight with little control over what happens to you. I played a game where one person kept getting the right ingredients and had a ton of potions in front of him. Anyone else who created something had to use one of his formulas, and the cycle continued as he pulled farther and farther ahead. However, I believe this could be negated with a little strategy that might not be readily apparent. It’s always tempting to play a new element on the Desk for that extra point, but holding on to it longer and doubling up on an existing element could force the other players’ hands, resulting in the elements you need being available to you instead of the other way around. It’s all part of the learning curve of the game. So it’s not Carcassonne, but Potion Making Practice is a fun, lighthearted game, and I think it would work well in a family environment. The concepts are pretty easy to grasp especially once you start going, and the game tends to move fairly quickly. It generally ends up pretty balanced between players as far as points being scored. A final note: we haven’t talked much about the quality of the components in these Russian games. They’re all pretty similiar—decent cards with a few thin cardboard tokens. However, I thought I’d mention that I hate the scoreboard in this game. Like Carcassonne, each player has tokens that move along a path indicating how many points they have. 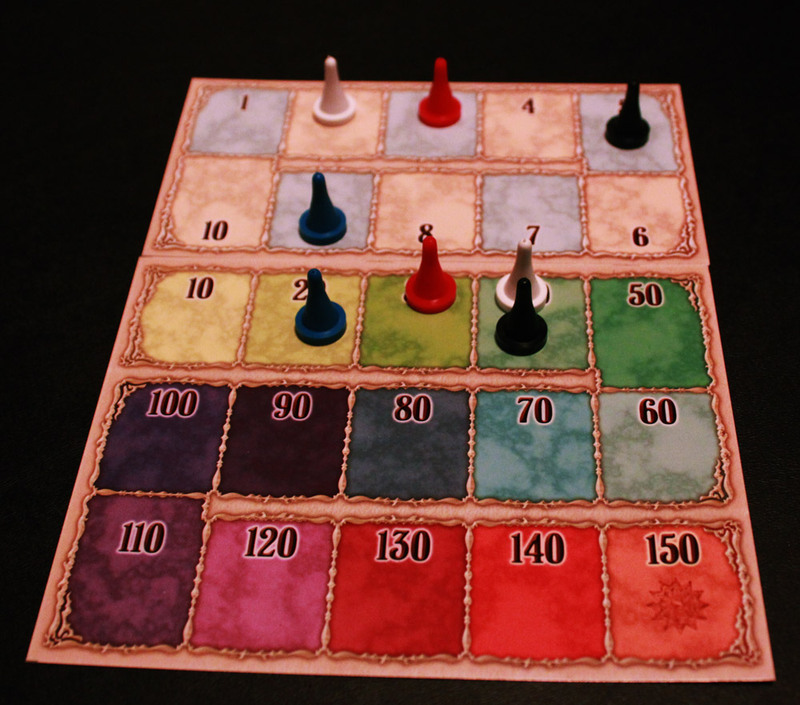 Unlike Carcassonne, the one in this game is broken into two parts—the ones track and the tens track. Aside from the general editing error of listing 1-10 and 10-150 instead of 0-9 and 0-140, it becomes a headache to track points. It doesn’t seem like a big deal, but it requires far too much thought—”did I move the tens ahead, or did I forget? Wait, I thought I was ahead… oh, I forgot to move up to 20… hold on, did this get knocked?” It’s a small thing, but still. I hate it. I also like when cards are used for multiple things, which PMP implements well. That a card can be used as a formula or an element, and these two things are scored differently, is a great way to cause interesting decisions with little effort. The game is interesting and moves along at a decent pace, though it lasts a bit longer than it should for what it is, in my opinion. 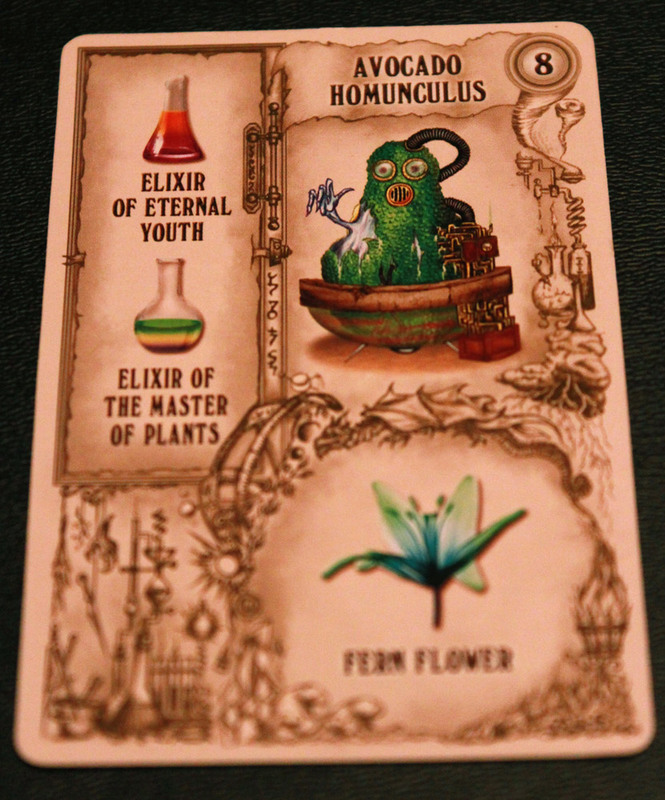 Despite the theme and the multiple uses for cards, though, I wasn’t overly impressed with Potion Making Practice. It’s not bad, but while I really like the theme and even the implementation of the cards in this game, there is one thing that’s hard for me to get around: the amount of luck present in the game. As in most card games, you are limited by the cards you draw in what you can do in the game. If the cards you draw all have basic formulas on them (i.e., ones that require only elements and not other formulas to make), you lose out on the opportunity for gathering more points. You still may get points when others use your formulas for making bigger ones, but not as many as if you had made the bigger one yourself. Also, since spell cards are so rare (and getting one is dictated simply by who draws it), they can sway the game in favor of those who draw them with little chance to even out their windfall. A brief aside: I find @Futurewolfie’s quibble about the scoring system nonsense. I think it’s really an ingenious way to keep score, especially while keeping costs down. The fact that he doesn’t like it shows that he doesn’t keep score often. Okay, back to your regularly scheduled programming. Nice taxonomy. Too bad it’s on the back of the scoreboard. In conclusion, I wouldn’t turn down more games of Potion Making Practice, but I’m not sure I’d seek them out either. Playing the game is a diverting way to spend forty-five minutes or so, but I’d rather play two or three games of The Kingdoms of Crusaders. Of course, you might have more than two people in your group, in which case Potion Making Practice is a worthy choice. Disclaimer: Right Games provided iSlaytheDragon with a copy of this game for review. Solid review. Cards and theme DO look really appealing, but I think have enough highly random games at the moment. Not sure I need another at this time.